Some books are written to be important. That's not a bad thing. Nor is it necessarily a good thing. In this case, it's a great thing. I enjoyed reading George and it's a good way to help kids understand things they might be feeling or might have friends who are feeling. George is an issue book about being transgender. The plot is fairly thin - about wanting to be Charlotte in a school play which is the framework around which George tells her family and friends that she is actually a girl. But for books like these, the plot should be something that holds readers' interest without distracting them from the message. And it does exactly that. The book is quick enough for kids to enjoy yet simple and direct enough that kids will comprehend the message. I particularly liked that George/Melissa gets a variety of reactions to his personality and to her announcement of being Melissa. She has a lot of people who love her. I liked George's mom. She's not perfect, but she tries to do her best for her child. And I loved her friend Kelly. George/Melissa has a lot of supportive people in her life. But not everyone will be accepting or kind. Unfortunately that's reality for LGBTQ people, particularly transgender. As sad as that is, it's better not to sugarcoat it. Plus, when you see people being cruel to a kind person in a book, perhaps it would encourage you to behave better when you encounter similar situations. My only real complaint about this book is why the name Melissa? That sounds so 70s and 80s. How has a 4th grader even heard the name Melissa? I'd think a 10 year old would associate that name with their parents friends. I'd pick Madeline or Mackenzie or another cute, trendy girl name. But alas, it was not for me to choose. 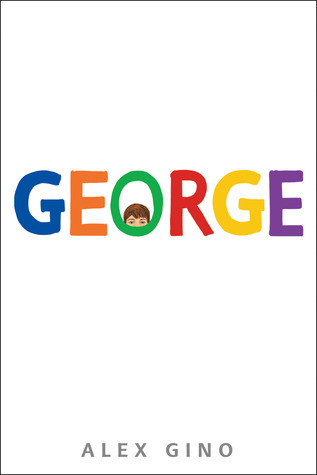 George is a great read for kids today. It helps them open their eyes to all different kinds of people and to understand that we're all essentially the same. It's a great encouragement for kindness and acceptance. Recommendation: Buy for your middle grade reader. I'm really looking forward to picking this one up. I'm glad that there are more LGTBQ middle school reads available now. I've been seeing this book everywhere! It sounds fantastic.